No, I haven’t forgotten about this lovely project. 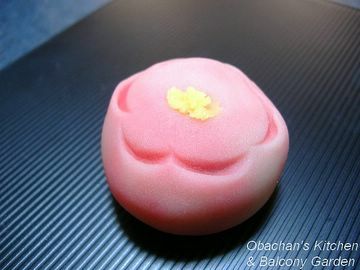 This is the wagashi for February: Kobai (red plum). 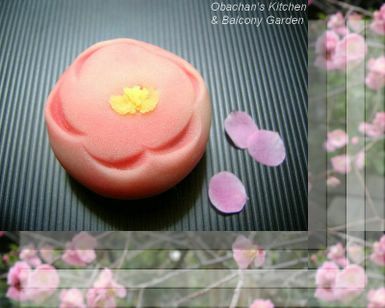 It’s such a shame that my photos cannot show the delicate and elegant color of this wagashi. These photos do not show the beautiful gradation of reddish pink to very light pink – almost white – unfortunately. There’s one thing I learned after I started this project of combining photos of wagashi and plants/flowers of the season that it represents. 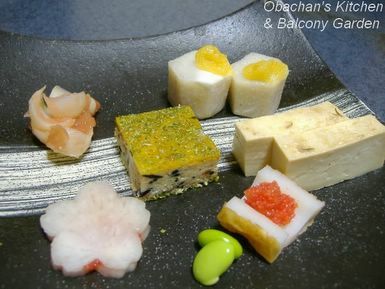 The fact is that the wagashi is supposed to go a little ahead of time. 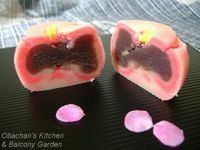 In other words, they make and sell, for example, persimmon-shaped wagashi before persimmons are actually in full season. I took this shot at a nearby shrine. Plum trees in Japan originally came from China more than 1,000 years ago. 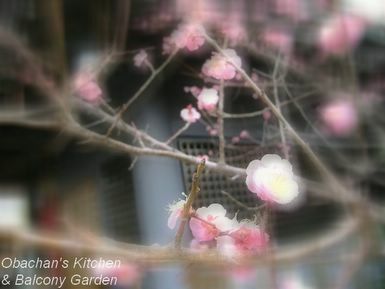 Initially, white plum blossoms were popular, but later in Heian period, around the time when “The Tale of Genji” was written, red plum blossoms became more favored, though that kind of trees do not bear fruit. Yes, I did this again. 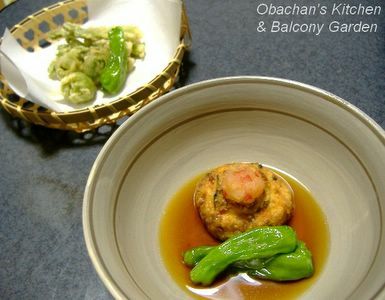 This is Obachan's quasi Kaiseki #2. 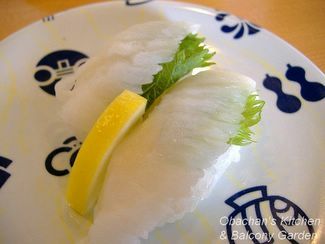 If you're interested in what Kaiseki is and why I call it "quasi-kaiseki," click here. This time, I made all these on one day (not today, though). Oh, sorry! Misozuke-tofu was an exception. I pickled it a couple of days in advance. * I omitted 刺身Sashimi (Sliced raw fish) this time. Yurine with Ume dressing: My favorite. I usually blanch yurine （lilly bulb) very briefly so that it is crispy on the outside and soft on the inside. 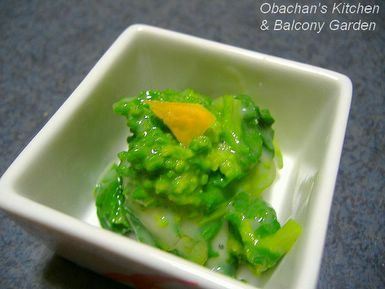 The seeded umeboshi (Japanese salty plum pickle) was sweetened with sugar and mirin. 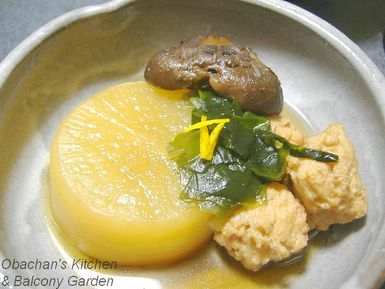 Taro with Yuzu miso: Yuzu miso was a great success, but I had to use peeled and vacuum- packed taro potatoes, which were no good at all. What a disappointment. Chigusa yaki: This is basically tamagoyaki with minced vegs and ground meat mixed in. 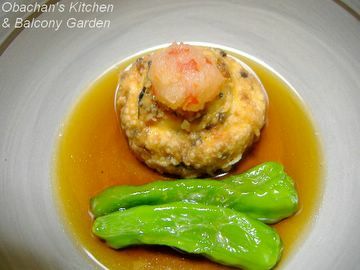 The hijiki seaweed (the black bits in the square-shaped fried egg in the photo), ground chicken, minced carrot and black mushroom were seasoned with sake, mirin, sugar, soy sauce and dashi. This time I didn’t make the tamagoyaki very sweet. This was heated in a frying pan first till the egg was half set, then poured into a square baking pan and baked in the oven. When the surface was set, I brushed it with egg yolk. Green laver flakes were sprinkled on top at the end. Misozuke Tofu: Tofu pickled in miso-sugar-mirin mixture for a few days. This appetizer is said to have cheese-like flavor and texture, but mine turned out too salty. I used the home-made moromi-miso that my colleague had given to me long time ago, which was very salty, so I shouldn’t have left the tofu in the miso mixture for that long. Next time I’ll try this with regular miso. 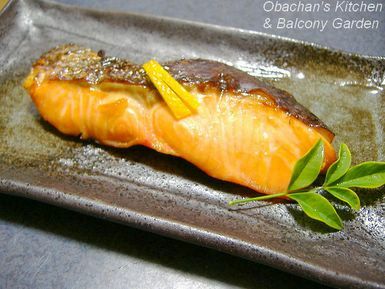 This salmon was marinated for about an hour in soy sauce and mirin based sauce with 3 to 4 yuzu slices. Oh, I really wanted you to smell this! While this was in the fridge, the aroma of yuzu filled there. And when this was being grilled… Hmmmm….!! Some of you might have noticed by now that my soup dish in this kind of meal tends to be made with whatever ingredients left from other dishes. But I do make a good dashi stock from bonito flakes and rather-expensive rausu kelp for this kind of course meal, so you have to give me a credit. This was my first time making home-made ganmodoki. The photo here shows how the tofu-veggie mixture looked before being deep-fried. I had read about how great it tastes when home-made, and now I understand! 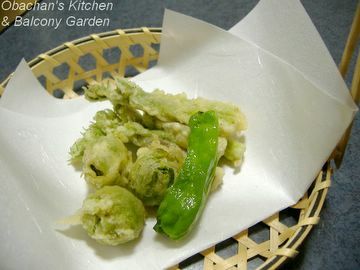 These deep fried greens were supposed to be lovely…but unfortunately the fukinotou (butterbur sprouts, the ball-like ones in the photo) were so bitter! Later I was told that the younger the sprouts, the bitterer they are. I should have bought them 3 to 4 days in advance to let them bloom a bit more before use. Now I’m not sure if a dish with sumiso (vinegar-miso dressing) can be considered as vinegared dish in Kaiseki course in a strict sense. 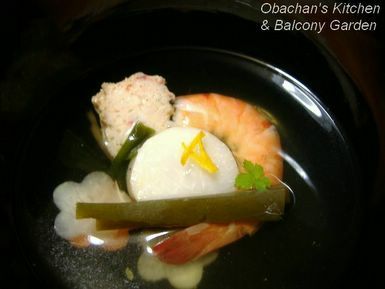 Oh, well, this is not “real” Kaiseki anyway. I wanted to use something springy, so here’s nanohana (field mustard). But to be honest, I like it with mustard dressing rather than vinegar-miso dressing. 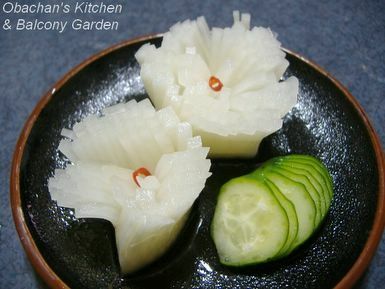 Originally I was going to use one of these daikon-chrysanthemums as a garnish for the salmon, but it looked too big for the fish, so I decided to present them as a vinegared dish. Again, I was going to use a turnip to make these chrysanthemums, but couldn’t find any. This takikomi gohan (Japanese pilaf?) was cooked in donabe (clay pot), and the (scorched rice) was just soooooooooo good, though I tried not to show it in this pic. The beige-colored bits in the rice are strips of aburage (deep-fried tofu pouch). This was my very first try and it was not a great success, honestly. Here’s some pics that give you an idea of how these are made, if you’re interested. 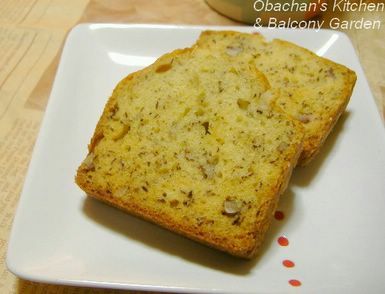 I had this sudden craving for banana-walnut bread today, so I baked one this afternoon. I gave up. There’s no way I can present tai no aradaki in a more sophisticated way, hiding all the grotesque parts. This is the best I can do. 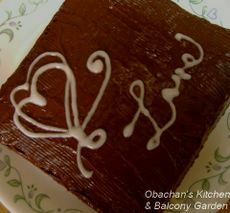 St. Valentine’s Day in Japan is not so much fun for this obachan who was once spoiled in the U.S. about this custom. This site says how it is like in Japan. See, I miss the nice cards and flowers I received on Valentine’s day when I was in the States, but here in Japan, women don’t get anything today. Yeah, of course, White Day comes one month later. But … I don’t mean to deny everything about Japanese Valentine’s Day and White Day, but this part of sending giri (obligation) gifts back and forth just to contribute to the sales of confectionery makers is … it’s not something I like very much. And wait and see. They’ll import the custom of “Black Day” from South Korea next. I'm almost positive. Though I didn’t take part in the chocolate-giving custom this time, I did something with chocolate to amuse myself. I baked my favorite ponkan bread (or cake?) and coated it with chocolate, in honor of St. Valentine’s Day. 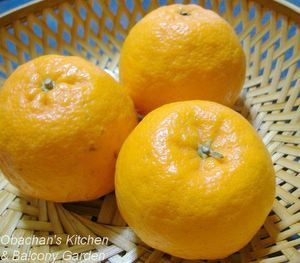 Ever since I found this recipe (Japanese) on the net about one year ago, I have made this orange cake many times using ponkan oranges from my dad’s orchard. This is my favorite. 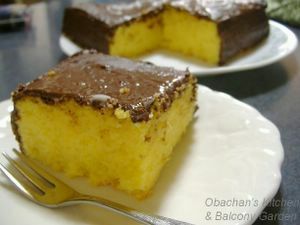 The aroma and flavor of ponkan oranges make the cake a little different from regular orange cake, and even my parents liked it when I made it once at their house. I heard that orange and chocolate make a good combination and I had been wanting to try it out. So, today was the best opportunity. And here’s what I learned today: The ponkan bread probably tastes better without chocolate coating. The place is called Marine polis. Don’t ask me why. I can only imagine that the “marine” has something to do with the seafood used for sushi, and “polis” came from “metropolis” or something… but I’m not sure. I liked this. 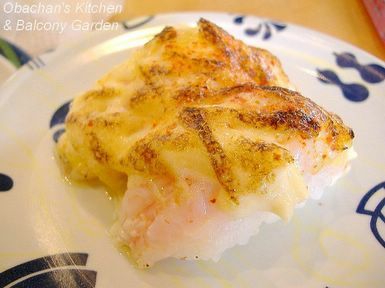 The shichimi pepper gave a nice kick to the familiar combination of mayonnaise and prawns. 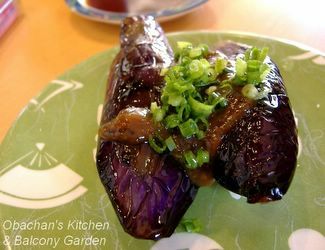 Fried eggplant with miso glaze sushi? I didn’t try, but these were my friends’ favorite. They looked so happy eating these, so I’m sure this will be on my “things to try next time” list. This is my absolute all-time favorite. Mmmmm….!! I wish I had more money that day. 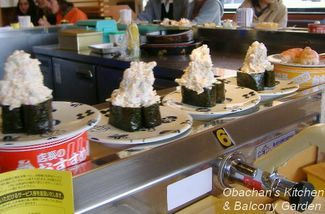 BTW, in a kaiten-zushi shop, sometimes the conveyor makes me feel a little dizzy. Does this happen to you, too? Looks like a few of the kitchen staff are going to quit at the end of this month.It always feels kind of strange to work with someone, knowing that the person is going to be gone soon. New entries to be added to our menu. With the leftover walnut sauce, I made this dish. I sautéed ground meat with chopped lotus root, then seasoned with the walnut sauce, sake, miso, tou ban jan and soy sauce. 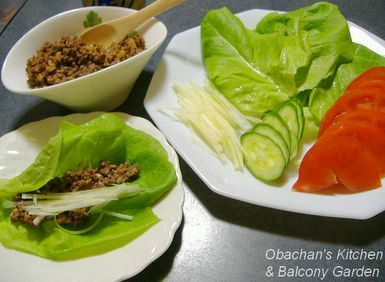 Wrapped in lettuce with shredded celery, the sweet-spicy meat tasted pretty good, though with no trace of walnut flavor at all. Here’s my another experiment with mochi. Kurumi mochi seems to be fairly popular especially in northern part of Japan, but I’ve never tried it before. 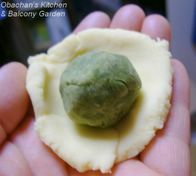 I combined a couple of recipes I found on the net to come up with this recipe, and I think this can be improved somehow, but not sure how. Toast walnuts to bring out their flavor (thanks Jen for the tip! :D) and chop them coarsely. Grind chopped walnuts in suribachi. Add sugar and grind well. Add water and soy sauce. Grind some more until the sauce is thick and smooth. 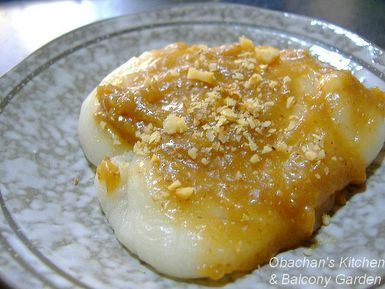 Wet and microwave mochi until tender. Dress with walnut sauce (glaze?). Top with chopped walnuts, if desired. If you like the sauce runnier, add more water. 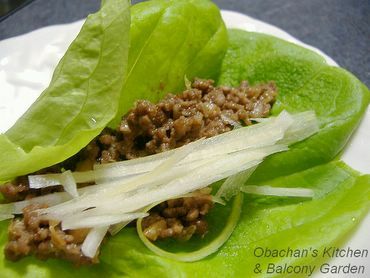 I tried adding a little sake, too, and it was not bad, but I thought the sake hid the taste of walnuts to some extent. I used this kind of mochi (made from glutinous rice) this time, but I think mochi made from mochiko (rice flour) will be OK, too. 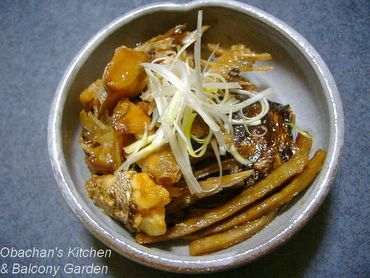 I made kaki furai twice this winter, and I was disappointed both times. I don’t know why… The oysters tasted rather bland. I thought it was my seasoning, so I used more salt and pepper on my second try, just to find out that it didn’t help much. One of the cooks at the izakaya said that smaller oysters would probably taste better. 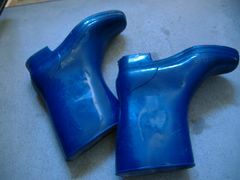 That’s right… the ones I used were quite big both times. Mmmm… next time I’ll look for smaller oysters. Bilbo tagged me for the 7 Meme the other day and I’m going to let the world know a little more about myself. 1. Go to Singapore and eat chicken rice. 2. Go to Australia and see Ayers Rock. 5. Live in a small house near the ocean with a big dog and a little kitty. 7. Clean my room and the bathroom completely and perfectly. Rosa’s Yummy Yums tagged me for the Common Cold Remedies Meme last month, and now here it is! Sorry for taking so long. This tamagozake is one of the common cold remedies in Japan. As the name indicates, it’s a mixed drink of egg (tamago) and sake, sweetened with sugar. 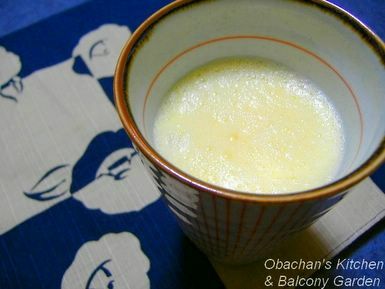 The sake is supposed to give you a good sleep and the lysozyme in egg white is said to strengthen the immune system and thus help cure the cold. In a saucepan, heat sake and let it flame for a while to evaporate alcohol. Remove from heat and wait for a few minutes to let it cool. Add beaten egg to sake little by little (do NOT add all at once), stirring well. 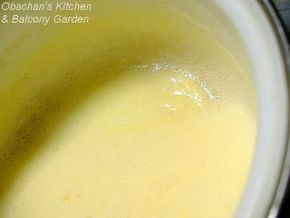 Add sugar and heat over a VERY low heat, stirring continuously until thick and creamy. Add a little ginger juice, if desired. Serve hot. I work at an izakaya pub in Japan, and kakiage don is something they often make for staff’s meal there. 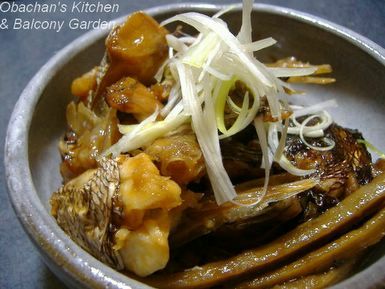 When this dish is served for supper, waiters/waitresses figure out that the kitchen staff is really busy that night and there aren’t much leftover ingredients in the kitchen. 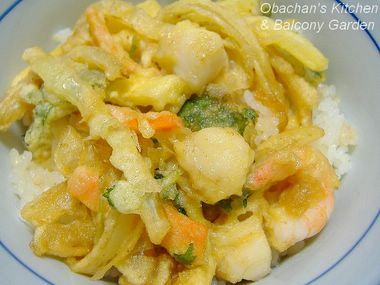 The vegetable/seafood ingredients can be substituted with your favorites. 1. Heat all tsuyu (sauce) ingredients in a sauce pan and bring to boil. Remove from heat. Set aside. 2. Shred vegetables. 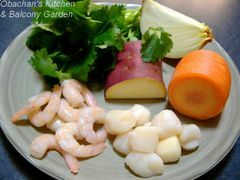 Cut seafood in small chunks. 3. In a bowl, mix egg yolk and ice water. (Do not get ice in the egg-water mixture. Add sake, if desired.) In another bowl, mix flour, corn or potato starch and salt and add to the mixture. 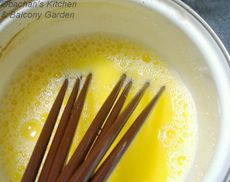 Stir lightly by running chopsticks or a fork through the batter in a “cutting” manner so that it does not develop gluten in the flour. 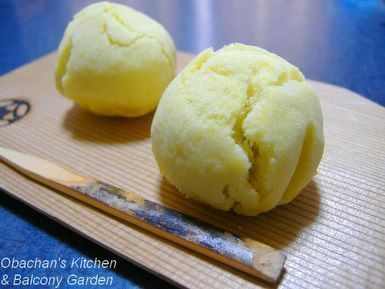 The batter can be lumpy and should be slightly runnier than regular tempura batter. 4. 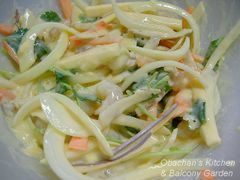 Add shredded vegetables and seafood chunks to the bowl that was used for mixing dry ingredients. 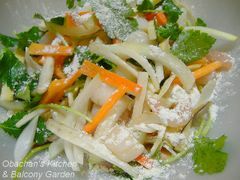 Sprinkle with a little amount of flour and toss to coat the vegetables and seafood. 5. Pour the batter over the ingredients and mix. 6. Heat vegetable oil to apx. 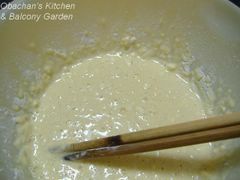 180 C. Take a scoop of the ingredients on a turner and let the excess batter drip off. 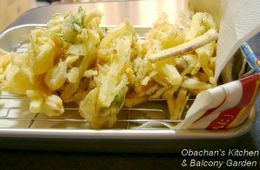 Slip the ingredients into oil, pushing gently with chopsticks or a fork. 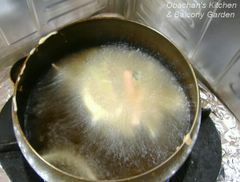 Deep-fry until both sides are golden brown. 7. Heat the sauce again. Pour sauce (apx. 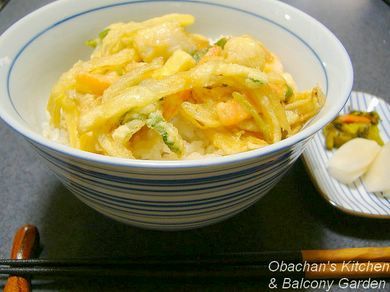 60 to 70 mL per serving) over warm rice in a big rice bowl (donburi). 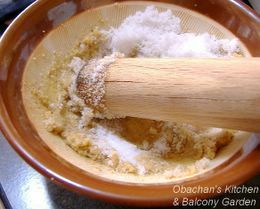 Place a kakiage on the turner and dip it very briefly in the remaining sauce in the saucepan, then transfer onto the rice. Serve warm. 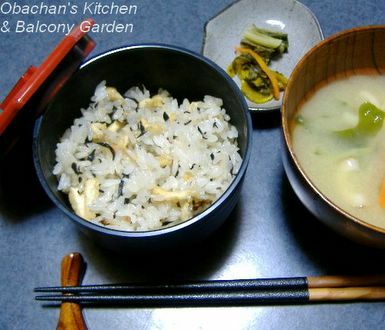 Serving suggestions: Pickles, soup (especially miso soup) and hot green tea would be nice accompaniment to refresh the tongue. If you like the kakiage crispier, just place it on top of rice without dipping in the sauce and pour sauce over it. 1. 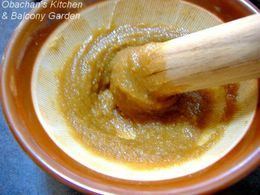 Use ice water to make batter and keep ingredients refrigerated until use. 2. Use egg yolk, instead of whole egg. 3. Add a little corn/potato starch to flour. 4. Add a little salt to flour. 5. Add a little baking powder to flour. 6. Add a little vinegar to batter. 7. Add a little beer or other kind of alcohol to batter. 8. Use mayonnaise instead of egg. 9. Use unsweetened soda water instead of ice water. 10. Use rice flour instead of flour. 11. Make batter right before you start deep-frying. Do not make it way beforehand. 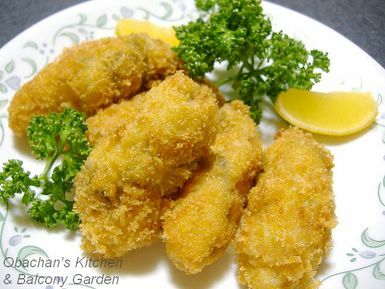 I have tried 1 to 4 and 11, and they seem to work for me, but you may not get the same result because the crunchiness of tempura also depends on other factors such as the kind/temperature of the oil you use, how you drain tempura, etc. 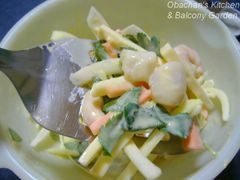 I use vegetable oil, sometimes canola, and at our izakaya, we use the mixture of shirashime oil (refined oil) and lard. 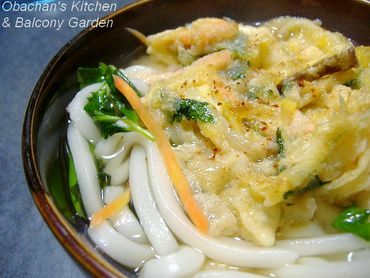 * Kakiage is also great for the topping of warm udon or soba noodles. I always do this with leftover soggy kakiage.